D – We always delight in dining with friends. This week was no exception. Wednesday night we celebrated the first UUMC Choir rehearsal after our summer break with the “Doctors”. Can you guess where we landed? It starts with a “V” – yes, Vino Vino! 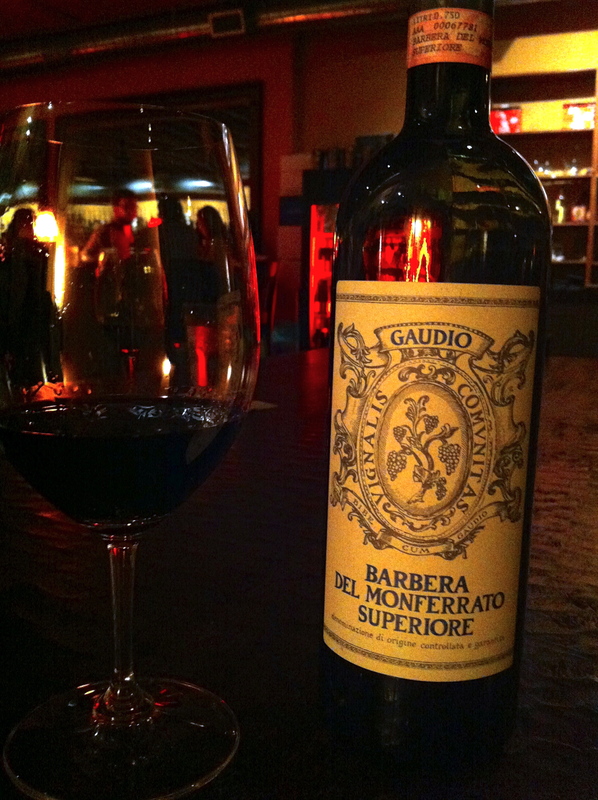 We enjoyed an outstanding bottle of Barbera recommended by the general manager. Superior as the name states! Sunday evening the “Doctors” joined us for an End-Of-Summer Feast. I tell you what-we have eaten some pretty amazing meals of late, both out and about and at home. We have also tasted some lovely wines. This evening was no exception. I’ll let Marc introduce you to the wines first (I’m drooling just thinking about them). M- This white wine is the absolute best white we have ever tasted. 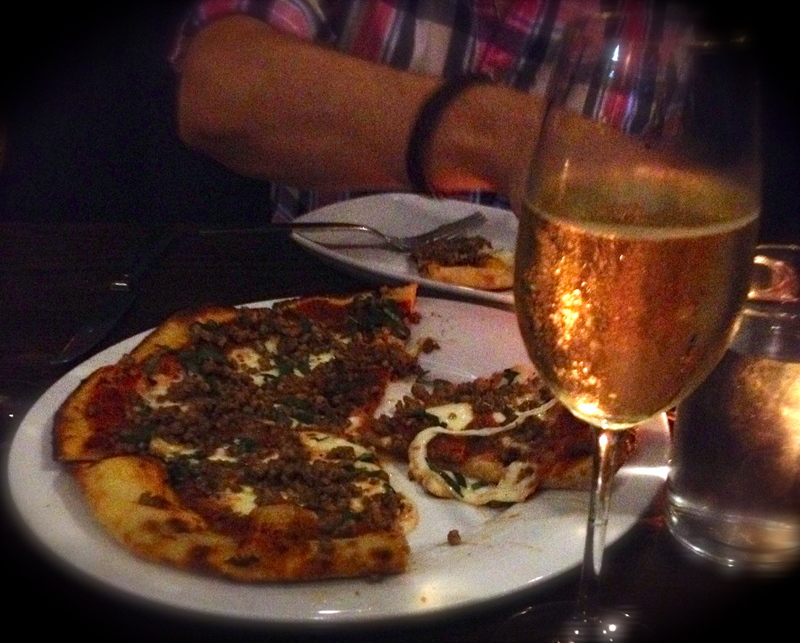 We first had it at Mulberry Wine Bar. The grape, arneis, is Italian grape from the Piedmont region. A beautiful mouthful of joy. Subtle flavors that emerge into a fragrant dance on the tongue. Elegant, decadent, gorgeaux! Campo de Montalban, a firm Spanish cheese made from a blend of cows’, sheeps’ and goats’ milk in La Mancha. 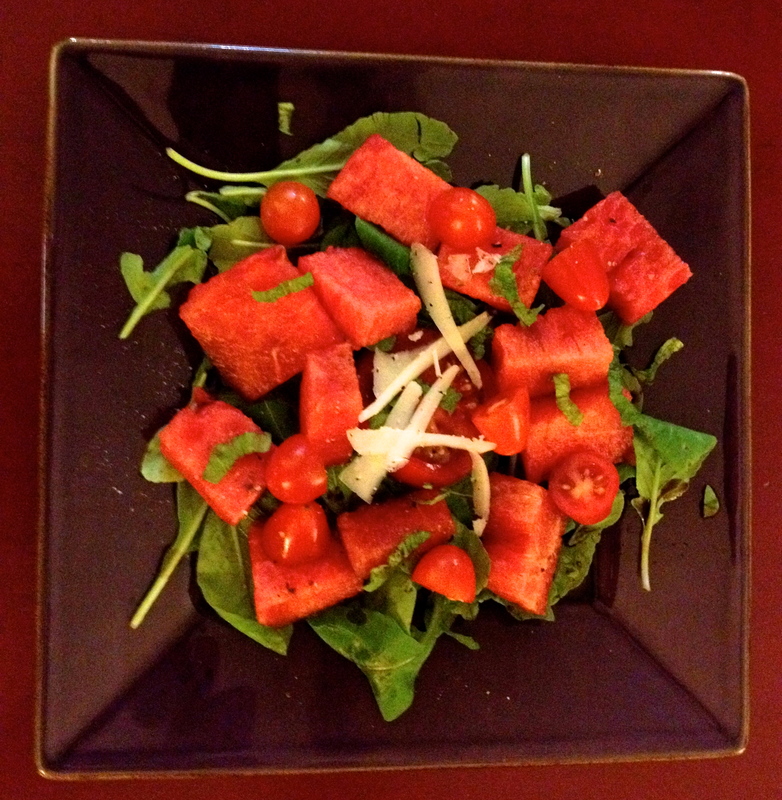 **Tomato and Watermelon Salad with Arugula— I tried this combo first at Vino Vino and was pleasantly surprised at how beautifully the sweet watermelon played with the tang of the tomatoes and the bit of the arugula. There were so many versions of this recipe online. I decided to keep it simple with a sprinkle of balsamic vinegar, salt, pepper and a few shavings of the Spanish cheese mentioned above. M – Red wine with steak? But of course- This wine is a lighter red than one might think would go with the meat and the sauce listed below. But, the excellence of this wine lies in its ability to be a strong yet courteous dance partner with the dish. Dancing with the dish, supporting the dish, not stepping on the dish, and showing its presence in the dance. M- I love the challenge of cooking steak. I usually cook sirloin. I like the cut, thickness, and fat content or lack there of. Debra likes her steak rare…horns off, run it through a warm room. The Doctors asked for medium-rare and medium-pink respectively ;). I’m eating them more medium-rare. I’m cooking on a gas grill, olive oil/salt & pepper, sear each side, pull off the heat a bit 5-6 minutes each side, keeping the lid closed! I use the touch test to check for done-ness– like touching your face: your cheek for rare, tip of the nose for med rare, and touching your forehead for medium. Always letting it sit off the heat for about 4-5 minutes- the resting. **Tiramisu!! This was our first attempt at creating this traditional Italian sweet. We were so delighted with the result! I will admit that selecting a recipe was daunting. There are so many variations, and everyone insists that theirs is either “most authentic”, “best tasting” or “easiest to create”. We settled for a slight variation on the recipe found on the package of ladyfingers that I bought months ago just for this occasion. We only used two eggs (No, we did not cook the eggs and everyone survived). We added Kahlua as our liquor. We made the coffee with Marc’s Nespresso machine. The trickiest part of the recipe was preparing the different components in order, cleaning the beaters of the electric mixer in between each. Assembly was very easy – just the perfect amount for a 9×13 pan. I am so excited to have added this dessert to my repertoire. It will most likely be making a command performance soon! D – If you have not taken in a movie at the Violet Crown Cinema, it is a must! Not only do they create one of the most comfortable and easy forms of movie watching in Austin, but also are located near several good options for a bite to eat and/or a drink before or after the film. In fact, they have a kitchen and bar at the cinema that serves delights that you can take into the theatre as well. After the movie, we had almost 2 hours of free parking left, so we decided to walk down to Bar Congress, recommended by a new friend of ours that knows her wine. Bar Congress is one of three establishments on the corner of Congress and 2nd street. The indoor seating at the bar was full, so we took a seat outside. After waiting too long for someone to take our order, we went back inside and walked over to the Second Bar and Kitchen. They had seating inside available, so we opted to try this option instead. I was in the mood for some bubbles, so I ordered a 2009 Cava, Penedes, Spain. 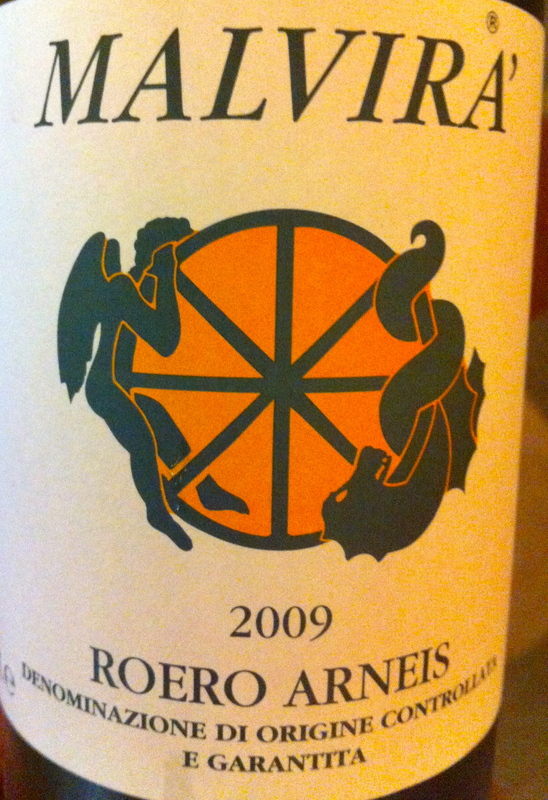 Marc selected a 2011 Grenache Blanc Blend, Cotes du Roussillon, France. Both were refreshing and made us realize that sitting outside on an August evening in Austin was not a good idea. We shared a pomodoro pizza with Italian sausage (substantial size for two, the addition of the sausage provided some hearty flavor – good, but not something to put on the “rave” list). Our waitress quickly slipped a dessert menu down as she was picking up our empty dishes. There were several intriguing offerings, so we treated ourselves to the blueberry vanilla fried pie with candied pecans and cinnamon toast ice cream (very underwhelming – the pie crust was flavorless and greasy, and not enough filling to truly enjoy the blueberries). If you want to treat yourself an amazing fruit pie, go to the Monument Café in Georgetown, Texas – now that is a fruit lovers delight! Next time we go to the movies, my vote is for Mulberry. 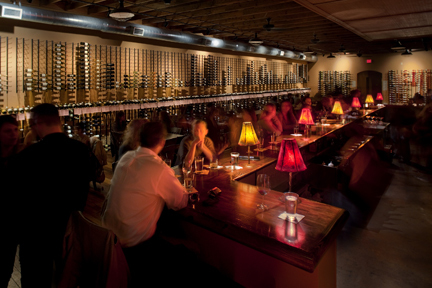 Can’t wait to share this cool little wine bar with you in the future! A few weeks ago the Austin American Statesman featured an article about an “authentic” British café in South Austin. I’m guessing that the London Olympics may have prompted the paper to feature this establishment. So my Dad read about the FULL ENGLISH CAFÉ (www.fullenglishfood.com ) and suggested that we take my Mom (who is British) to check it out before I have to go back to school. The menu is primarily breakfast oriented, with plenty of British swagger. Both of my parents smiled when they saw the likes of bangers, Heinz baked beans, fried toast, and Cornish pasties. 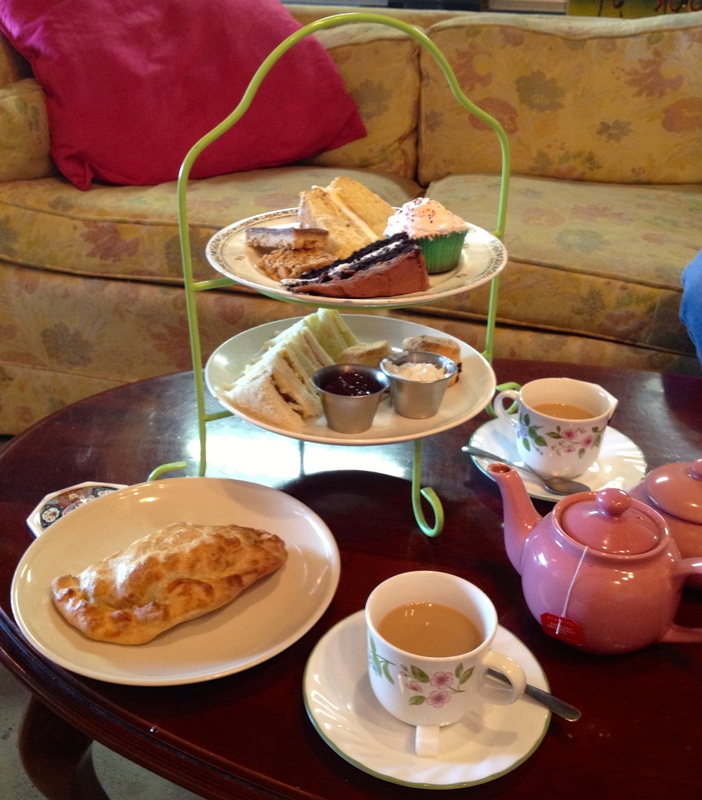 We decided to share a “high tea”, which I will describe in a moment, and a beef Cornish pastie. Of course, a nice pot of tea was a must to accompany the spread. 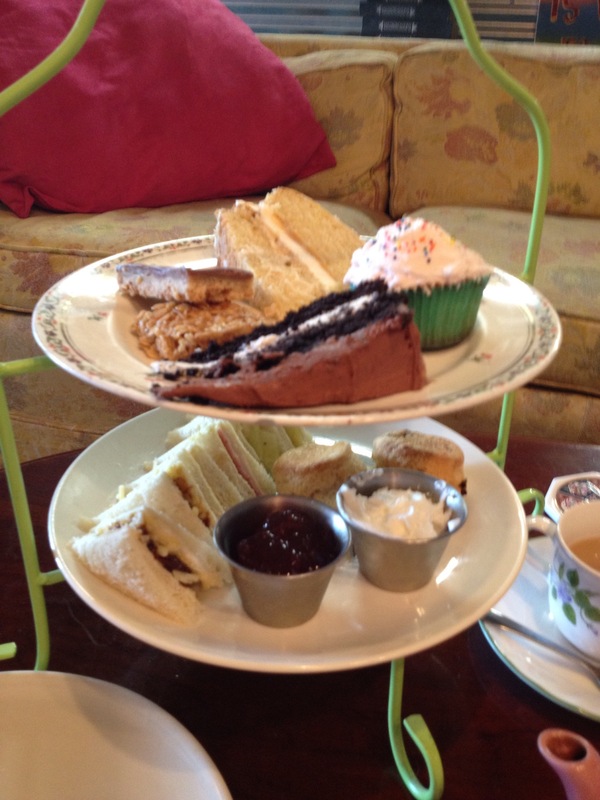 High Tea included a pot of tea and tiered platters of sandwiches (cucumber, ham with mustard, and cheese with chutney) and sweets. My favorite was the cheese and chutney – bold English cheddar cheese with a flavorful apple/pear chutney. Dad and I both agreed, however, that the chutney needed a little “punch” of heat or a little more spice to balance the sweetness of the fruit. The sweets included two scones, two slices of different cakes, a cupcake and two bars. The scones were good, served appropriately with some whipped cream (correctly prepared to fill in for clotted cream – good consistency for spreading and not too sweet) and strawberry preserves. I did, however, wish for currants instead of raisins. I have yet to find any place in America that makes scones with currents. If you have never had a traditional cream scone with currents, they are lovely – especially with tea. I just made a batch this morning – I’ll share the recipe at the end of this blog entry. The surprise treats were definitely the bars. I had never had either. First, the English flapjack – a granola type bar with oats. Then my favorite of the sweets, a slice of Millionaire’s shortbread – a layer of shortbread, then a layer of buttery caramel topped off with a layer of chocolate. Delicious! The cake slices were fine (one white with a layer of that buttery caramel, and one chocolate). The cupcake came home for the boys. Finally, I’ll mention the Cornish pastie, a hand-held pie filled with seasoned beef and potatoes. For $5 it is a real deal and can be eaten hot or cold, especially nice with a side of chutney. The history of this British dish is an interesting read(en.wikipedia.org/wiki/Pasty ). You can see the pastie in this pic (bottom left). I’m happy to know that there is a place in town that shares British tastes on china, yet in an unpretentious setting. Dad and I both told the owner that we would return. Dad plans on sharing a CD of great British Pub music and I will be taking in a sample of my cranberry chutney as we closer to the holidays for a chutney “trade”. Here’s my favorite scone recipe—with currants. In a large bowl, stir together the flour, sugar, baking powder, and salt. Cut the butter into ½-inch cubes and distribute them over the flour mixture. With a pastry blender or large metal whisk, cut the butter until the mixture resembles coarse crumbs. In a small bowl, stir together the cream, egg and vanilla. Add the cream mixture to the flour mixture and stir until combined. Stir in the currants. With lightly floured hands, pat the dough into a ½ inch thickness on a lightly floured cutting board. Using a floured round biscuit cutter (or small glass), cut out rounds from the dough and place them on the prepared baking sheet. Gather scraps together and repeat until all the dough is used. Bake for 13 to 15 minutes, or until lightly browned. Remove the baking sheet and cool scones for 5 minutes. Using a spatula, transfer the scones to a wire rack to tool. Serve warm or cooled. Store in an airtight container. 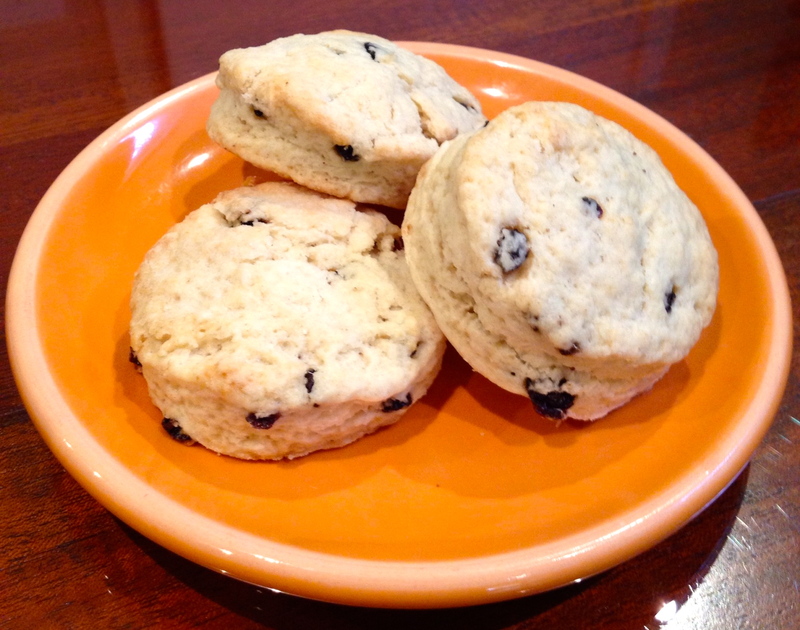 ** If you want a “glazed” look on the surface of your scones, mix an egg with about 1 tsp. of water. Lightly brush the tops of the scones with the egg mixture right before you place them in the oven. 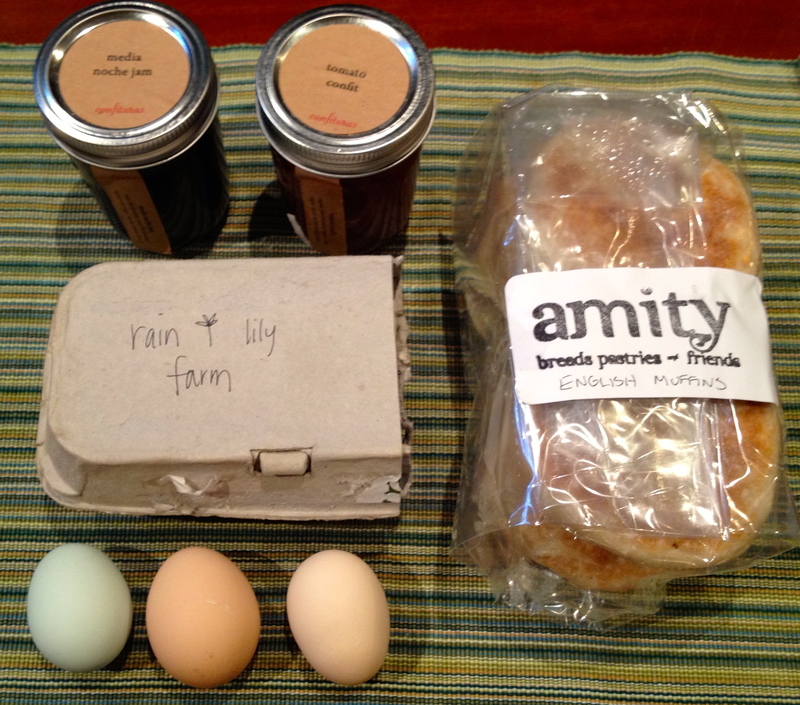 D – If you’ve been following our blog, you’ve read about FARMHOUSE DELIVERY (here’s the link, just in case). I just can’t express how cool it is to eat locally-sourced foods. It feels like we are supporting friends that live right next door! Do you have a favorite locally grown or produced food item? Please share what is is and where you get your hands on it! D – What a great evening! It began at a performance of the opera LITTLE WOMEN presented by SPOTLIGHT ON OPERA ( www.spotlightonopera.com ). We were blown away by the production! This was our first opportunity to hear Mark Adamo’s beautiful score, and all of the performers tackled the challenging music with confident singing and great storytelling. BRAVO! 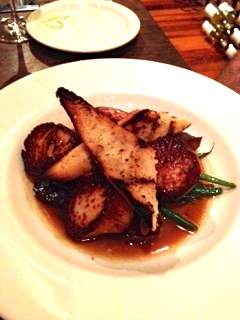 Scallops, sunchokes, haricot verts, heirloom garlic fumet – praised by the diner who proclaimed the scallops “perfectly cooked” throughout, with a gorgeous pan seared crust on the outside. Thomasville Tome cheese, tomato-orange marmalade, basil – one day I will remember to take a picture of this lovely plate before I start licking it. 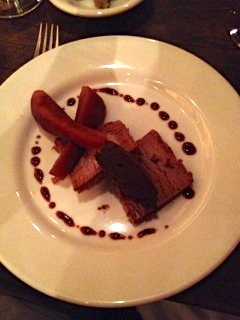 chocolate semifreddo, port ganache, poached pear – this photo does this delicate creation no justice. Goat cheesecake with roasted peaches – We’ve gloated over this dessert already in a previous post. 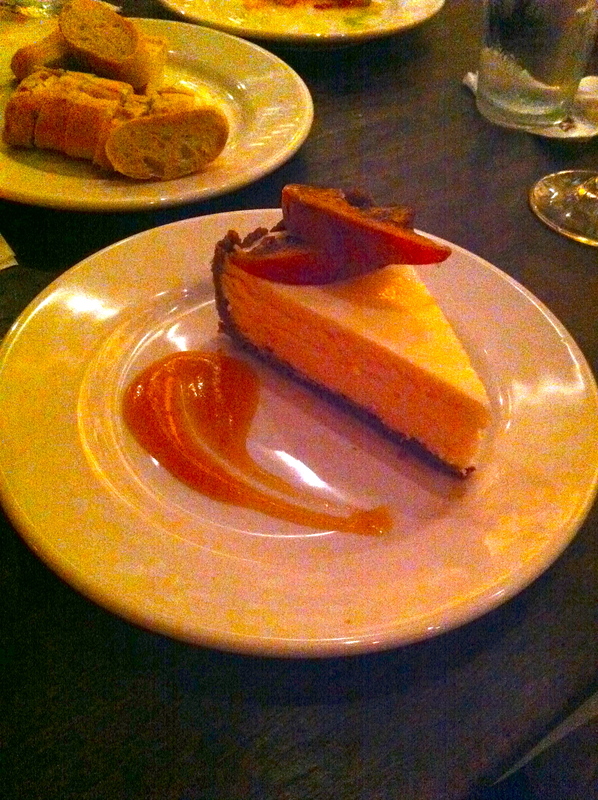 Simply the best cheesecake we’ve found in Austin. * Feudo Arancio “Dalila” ’09, Sicily, Italy – We keep coming back to this beautiful white as our favorite on the list right now. * Saracco Moscato D’asti ’10, piedmont, italy – the perfect pairing for the cheesecake. Yeah! The Olympics are finally here! What a great Opening ceremony! The Queen (and James Bond) stole the show, and the orchestra’s performance of “Chariots of Fire” was fabulous, thanks to the quirky antics of Mr. Beane. The slogan of this year’s games, “Inspire a Generation” rang true as several young athletes lit the Olympic torch at the conclusion of the evening. What better way to celebrate the UK games than to partake in a little British cuisine. Although my Mom prepared several of the classic dishes for us growing up, I never got my hands on any of her recipes in writing. Enter the world wide web – there are several foodie sites from England that feature versions of the traditional dishes of the UK. I stopped by SPROUTS today for some of their fresh chicken basil sausage (lovely grilled J). 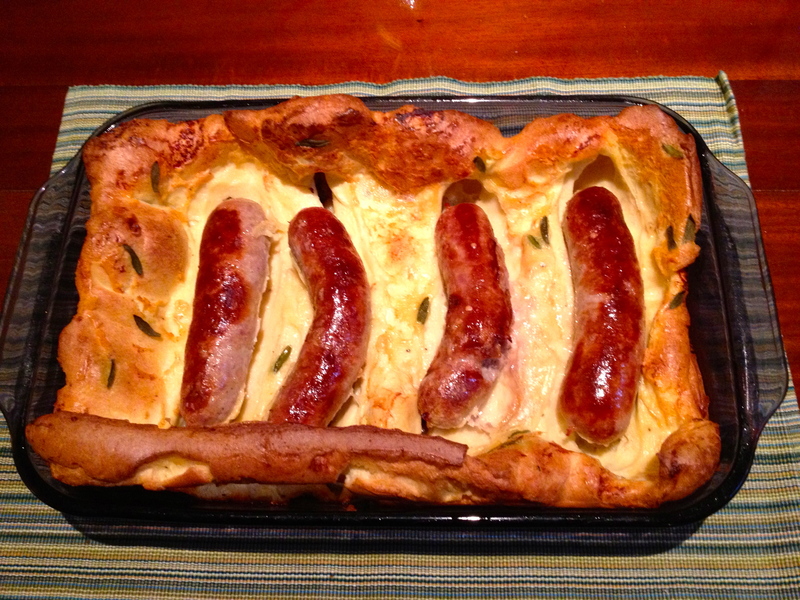 That is when I saw the English bangers and knew exactly what I was going to fix this evening – Toads in a Hole. A pretty simple dish of sausage and Yorkshire Pudding. For those of you who have never tried Yorkshire pudding, it is very similar to a popover – an “eggy”, spongy bread. It poofs up when it is cooked, and then deflates pretty quickly after you take it out of the oven. Of course, Yorkshire pudding is best when it is cooked in roast beef drippings, but for this dish, you’ll just use vegetable oil. One suggestion I would make, however, is to brown the sausages briefly in a little oil before popping them in the oven. If you don’t have a metal pan that can go from stovetop to oven, use a frying/sauté pan to brown the sausages, then add a little extra vegetable oil in the pan and pour those drippings in the dish that will go in the oven. This will add just a tad more flavor to your dish. I also had some fresh sage in my garden, so I sprinkled sage leaves over the pudding before putting it back in the oven to finish the cooking process. Although we will not be adding this dish to our regular dinner rotation, it was extremely tasty – just not enough redeeming “health” benefits. It did bring a smile to my face and sweet memories of my Mom’s cooking. Classic Cream Scones, Cornish pasties and a Victorian Sponge Cake are on my short list of recipes to enjoy during the remainder of the Olympics. We will definitely be watching lots of soccer. I am also hoping to catch some gymnastics, diving and the trampoline. Archery is on the TV right now. What Olympic sports are your favorites to watch? What young person will you inspire this week? On our return trip to Austin from Colorado, we once again stopped in Amarillo for the night. 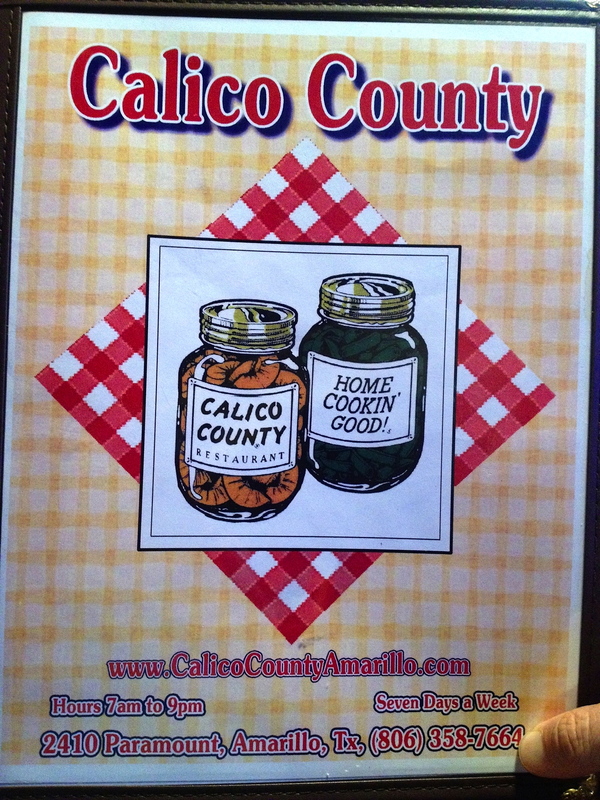 A special friend from college recommended we try Calico Country for dinner for some good homestyle cooking. 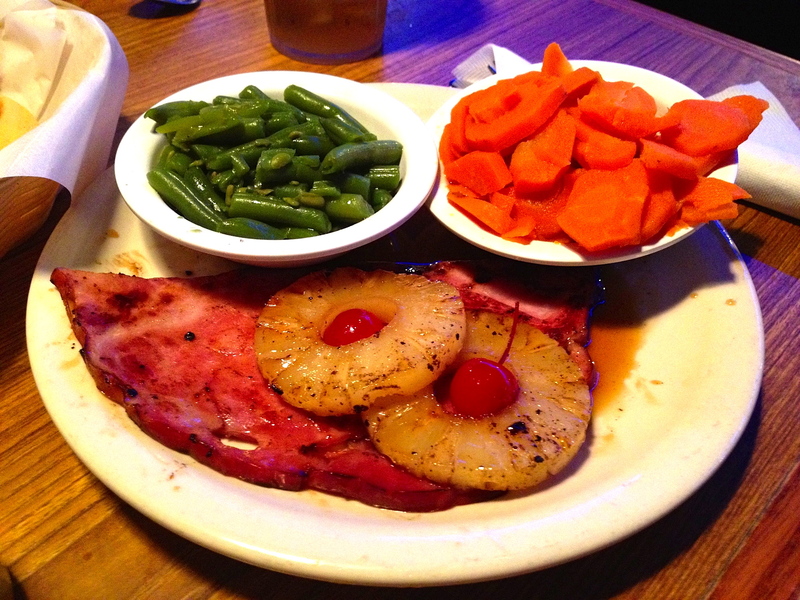 The menu is extensive and includes several home cookin’ favorites. 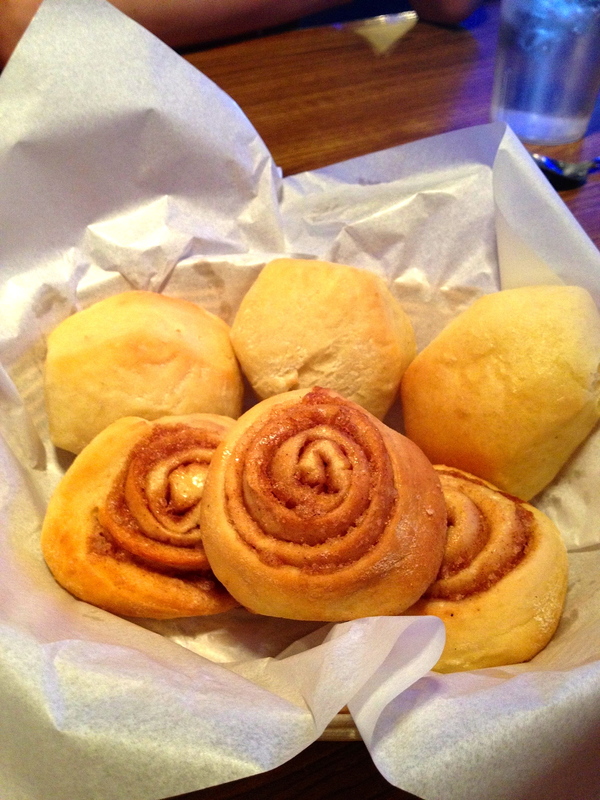 The meal started with a bread basket, which included two types of rolls. Yes, you are looking at cinnamon rolls in this picture. Not the usual pre-dinner carb, but too hard to resist! Yum!! Here are the entrees we ordered – many of them come with a “lite” (aka smaller portion) option. 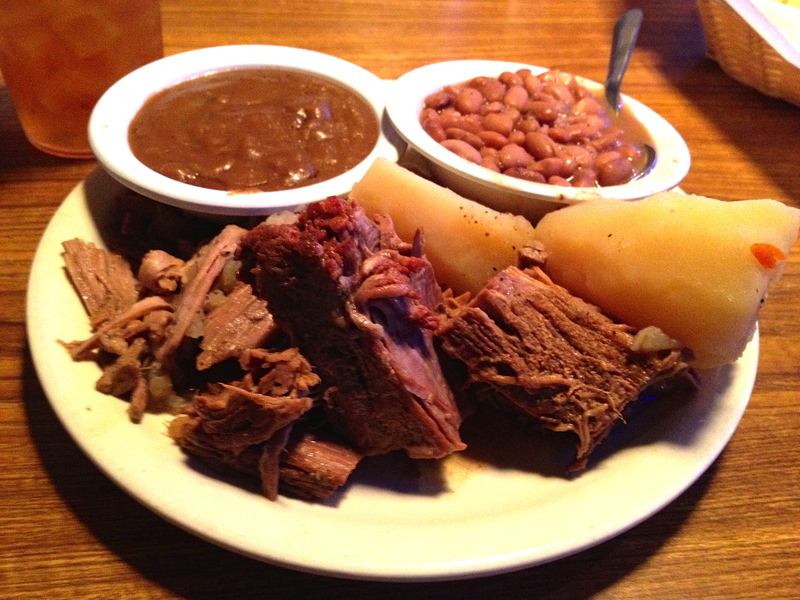 I ordered the pot roast with potatoes and pinto beans (my all-time favorite “bean”). No, I did not finish all the food on my plate. Turns out they accidentally gave me a REGULAR portion instead of the “lite”. Everyone at the table agreed that the food was good; nothing earth shattering, just good, old home-style cookin’. 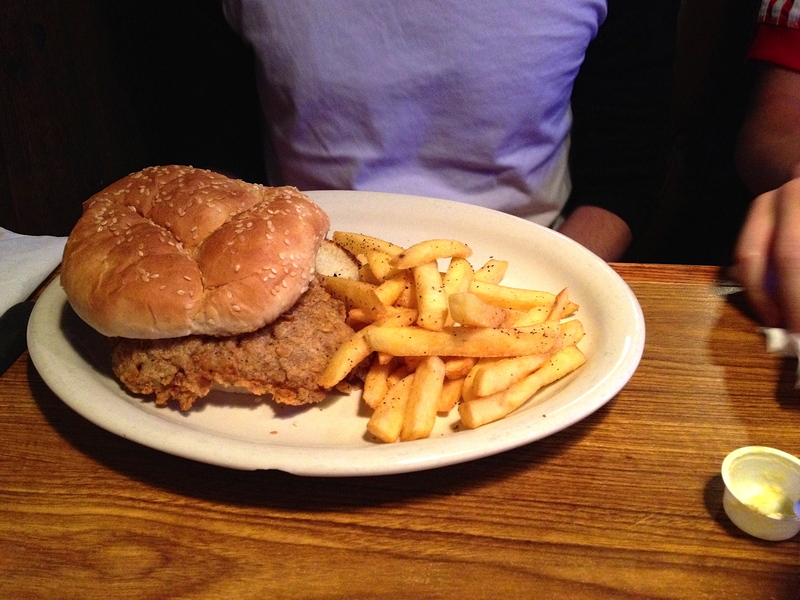 Now we have not one, but TWO new spots to eat when we are traveling through Amarillo – yeah!! PS – See our earlier post for our Mexican food excursion in the “Helium Capital of the World”.